Developing Android apps is a challenge: it's hard enough to write high-performing apps that run well, but you've also got to make them look good on a wide variety of Android devices. Fortunately, there are a many tools that take the pain out of developing Android, but they don't readily give up their secrets. To help with your user interface, the Android Graphical Layout Tools make laying out complicated Activities easy, and the HierarchyViewer does a great job of identifying complexity in your layouts. To help identify memory or resource issues you can use the Dalvik Debug Manager Service (DDMS) tools, which include TraceView and AllocationTracker. These make it easy to understand exactly where your application is allocating resources. There are tools to help simulate devices: the Android Virtual Device (AVD) tools. Lastly, there is a rich set of plugins for a variety of Integrated Development Environments that help streamline the development process:the Android Developer Tools (ADT) plug-ins. 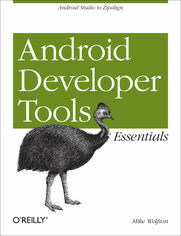 This book will guide you through the proper usage of all of these tools. It will describe in detail what each tool is designed to do, when and how to use them, and how to integrate them into your development workflow, making the development process less painful. This book will give you a better understanding of the variety of tools available, and empower your to design and deliver great Android Applications.